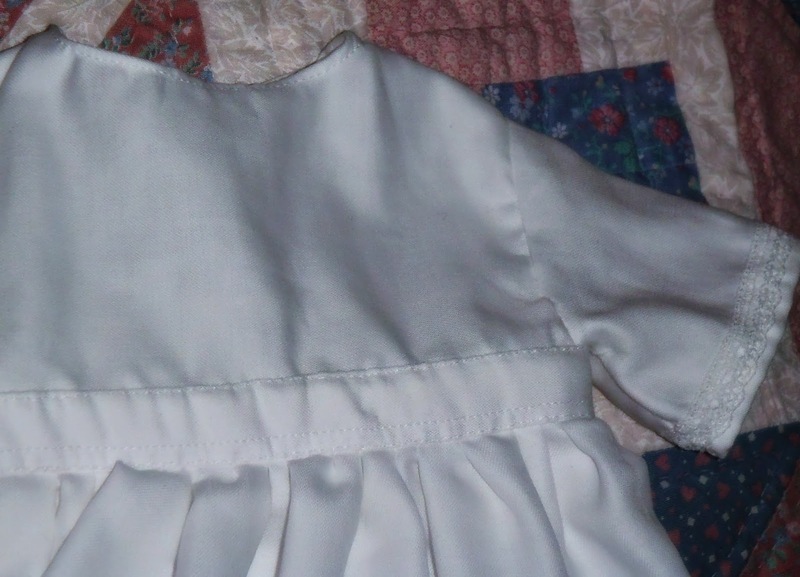 In my extra sewing time, little by little, I've been working on making a baptism gown for the new baby. These pictures, which are totally washed out by my flash, don't quite do it justice, but I still wanted to share. It also doesn't quite fit on the kid hanger that I put it on, which make the shoulders look not quite right... but here it is. I used Patch's gown as a pattern and laid it out and traced each piece of the top to get an idea of the sizing of the sleeves and front and back and measured out the bottom to get an idea of how fabric to use for the rest of the gown. I made one pattern out of fabric to keep and then copied it to make this gown. Surprisingly, the white cotton that I grabbed off the shelf in my room (I believe it was described as "satin cotton" when I bought it months and months ago) was the exact same cotton used in Patch's gown. And after measuring out the pattern and the gown I had the perfect amount of fabric. 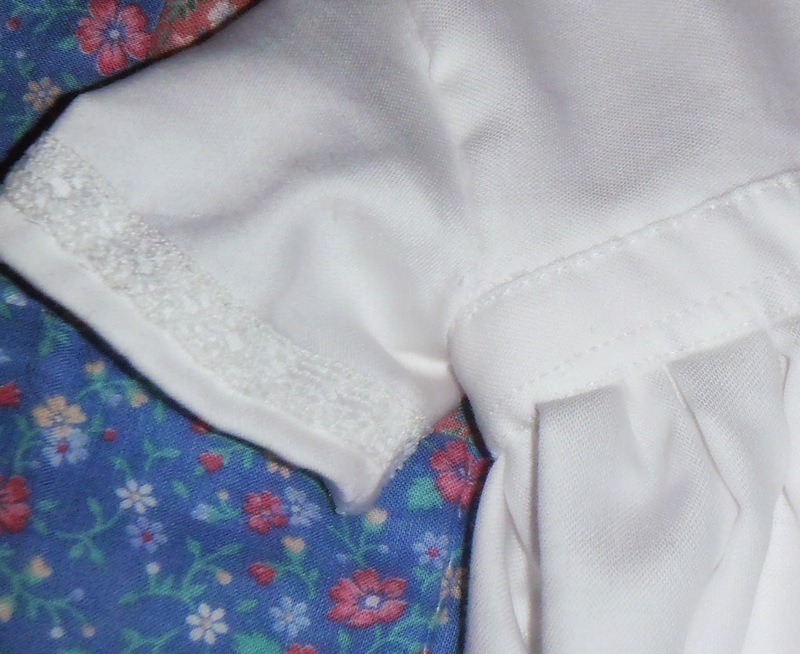 I still need to sew buttons on the gown, and I'm going to sew a slip and a matching jacket, but here's the main part. I found, as I was coming up with ideas for this gown, that I'm actually pretty picky. 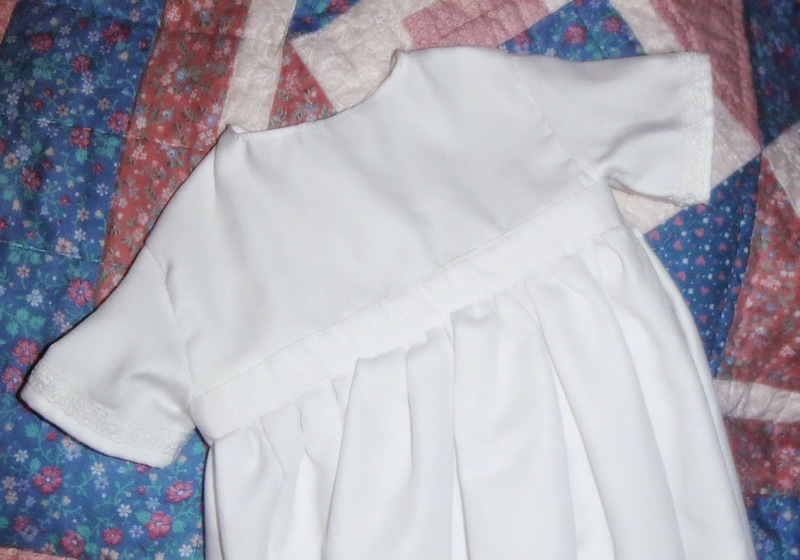 I went through pages and pages of photos of boy's baptismal gowns and none of them were quite what I had in mind. I love the gowns over the suit style, and I like the Peter Pan style necklines over the point suite type necklines, but I really like the plain, simple neckline over both of those. And I'm okay with a little bit of lace. I also followed the example of Patch's gown and used a single layer of fabric for the top part of the gown skirt and then doubled over the bottom half and carefully sewed a double layer that gives the lower part a bit more weight. I held it up to Patch's old gown after it was finished and it looks like the sizing is still on and it should fit! Time will tell! You might be wondering why I've made another gown for the new baby. The reason might seem a little bit silly with a perfectly good gown in the closet. I've always loved the idea of having the kids' baptism gowns framed in a shadow box. I have had this picture in my head of having one for each of our children that includes a picture of them in the gown from their day in a neat little case lining one of the hallways in our (someday) house. It's been such a special idea that we've managed to make it work so far, but I knew there was no wiggle room at all in the budget for a new gown this time around... and I thought that after the thousands of hours I've spent sewing over the last few years I could probably pull of making a gown now. So I started planning and so far I'm happy with the results! Hopefully the jacket is as easy to make! It's silk and while I actually have quite a lot of white dupioni silk (and I'll definitely be making a mock up in cotton first) it will make me a little bit nervous using it on such a big project! It is lovely so far. Very nice work. I especially admire the trim on the sleeves. Do you offer copies of your pattern in your store? I haven't, only because I don't really formerly know very much about pattern making. I'd love to take the class I've seen offered occasionally at Joann's now that Paul's done with school. The main problem selling it would be sizing it into different sizes. I'm not sure how I would convert it into anything larger than the size I'm making! I've never seen a boy baptized in a long dress like that! Anonymous, our family has an heirloom gown that my husband wore and two of my three boys wore. It really isn't that unusual. That is beautiful! I love the long gowns. I had a gown sewn by a friend for my oldest and youngest. You are talented for sure. 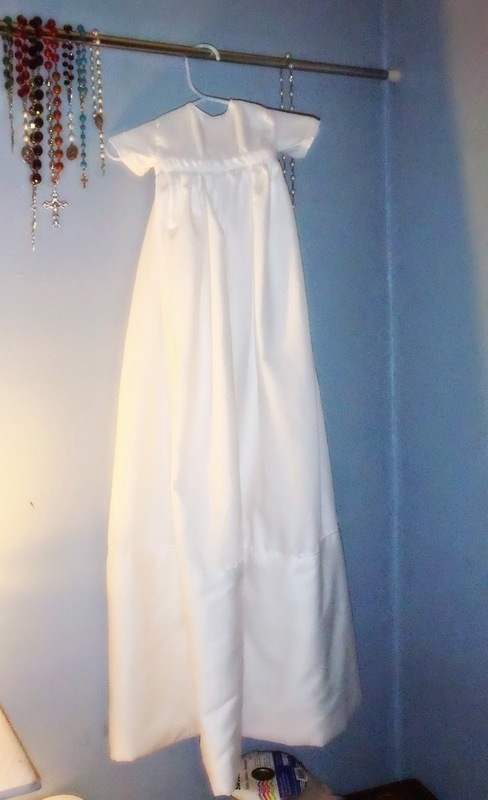 I still have my baptism gown my mom sewed mine out of her wedding dress complete with the lace. There budget was tight and she didn't like the gowns she saw so she made her own.